This ammunition is manufactured at the JSC Barnaul Machine Tool Plant located in Barnaul Russia. Brown Bear ammo is an affordable option for the budget-conscious shooter, offering quality, precision, reliability, and performance without breaking the bank. 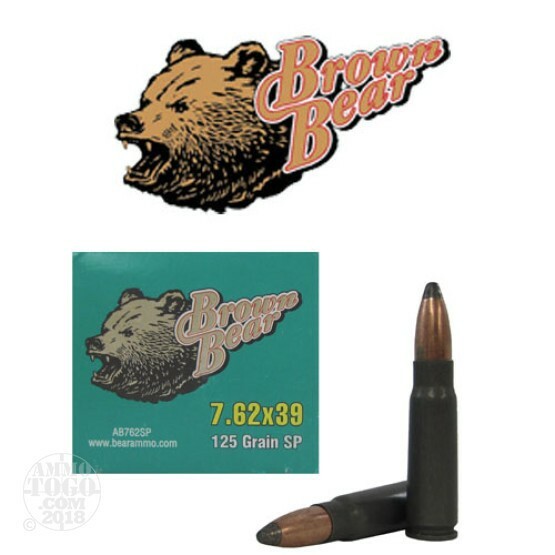 All Brown Bear rounds are loaded to the exacting standards normally reserved for mil-spec ammo, yet are available at a surprisingly affordable price. This package contains 20 rounds of Brown Bear 7.62x39 ammunition. Each polymer-coated cartridge is loaded with a 125 grain soft point projectile. Delivering excellent terminal expansion and effective tissue penetration, these rounds are well-suited for hunting medium size game, varmints, and coyote. This is factory fresh ammunition and features Berdan primers for reliable ignition and extended storage. Cases are non-reloadable, polymer-coated steel. Each round produces a muzzle velocity of 2445 feet per second. This stuff runs perfectly in my SKS and AK47. It will get the job done in the vast majority of situations, except for long range applications. Just an update this ammo will shoot less than 1 inch in my mini 30 at 50 yards using the factory iron sights. Excellent ammo. Highly consistent and reliable. Accuracy could not be tested due to weather but I did get fairly zeroed in at 50yds. My Mini 30 functioned flawlessly the factory mag failed no matter the ammo it was loaded with but my 10 round ProMag worked flawlessly. My rough group at 50yds. was 1.75" after sight in. Final target was destroyed so I never got to measure the last 5 shot group. You could eat the shipping and use the store credit, but it's hard to blame them--after all, they just sent what you ordered. I agree the language could be more specific in places for complete newbies, but you'd have to take that up with the Russians. Perhaps ATG left your review up to help stop other plastic bullet seekers from accidentally ordering this (though I suspect they may have left it up knowing that some of us would get a good chuckle).